One of my goals in keeping this blog is to be real with you all. I don’t ever want someone to come on Budding Homestead and be filled with self-doubt and feel like growing food is too hard, or they aren’t good enough. The reality is that I’m learning as I go along and that means lots of mistakes, lots of failures. (Plus I have kids so that means lots of things get left undone!) On that note, I’m going to share a really embarrassing photo with you all because it’s real and because it’s to be learned from. Oh my, it’s my asparagus patch! Yes, it really is. How can anything grow in there, you ask? Well…it can’t! 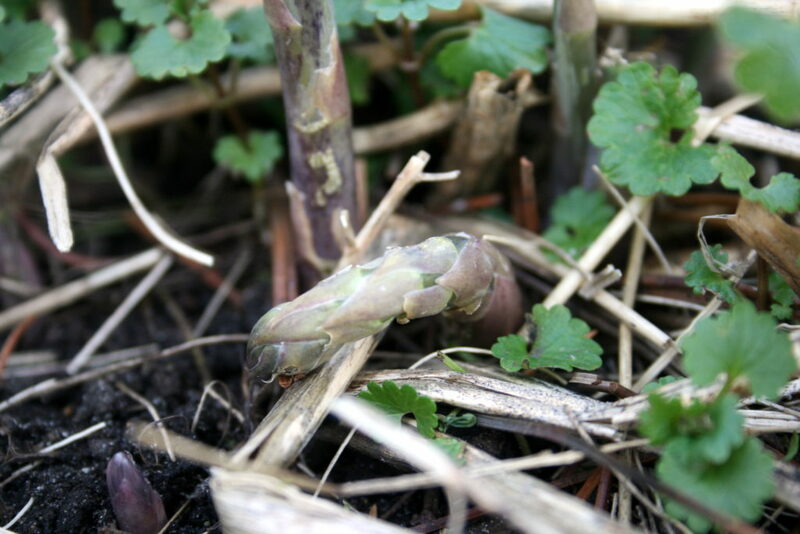 As I mentioned at this same exact time last year, I’m usually caught off guard when the asparagus starts poking up. It’s become pretty routine that on a nice Spring day, I’m gawking at the chaos and disorder of my yard following the snow’s melting, when I notice a spear out of the corner of my eye. “Poor asparagus!” I think to myself. How did it even manage to make it’s way through that mess? Then I scramble to clear and weed the asparagus patch, it takes off with gusto after that and we enjoy asparagus every day for three weeks. What’s the big deal, then you say? It is not a very good situation for a gardener to find themselves in because it is much more difficult to weed the patch when lots of little spears are breaking earth. It’s impossible not to snap a little head off on accident when yanking at grass, dead leaves and creeping charlie. I think I snapped six or so this year. In those early Spring days, my body is so starved of fresh garden vegetables that truly, every spear counts! 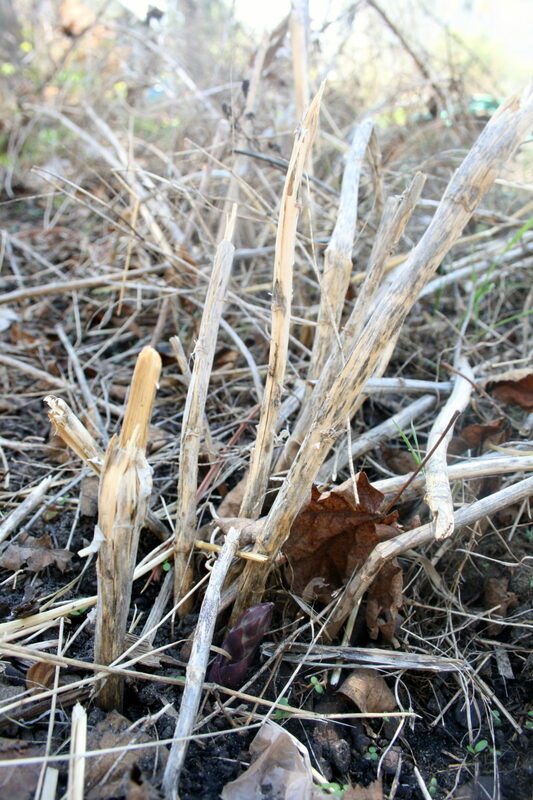 The spears that do begin to emerge while under a blanket of last year’s bushes will be wickedly white as they do not receive enough sunlight, or of an unappetizing hunched-over shape due to all the obstacles in their path. 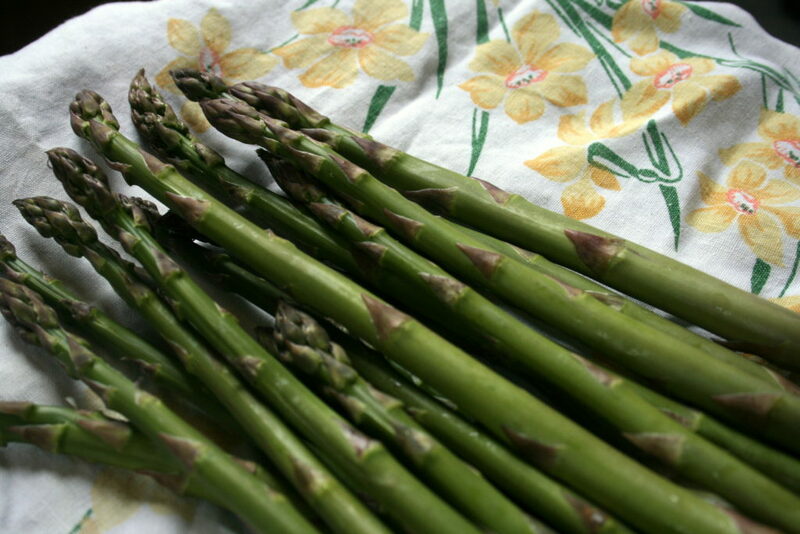 Plus, the sooner the patch is receiving sunlight, the sooner you will have asparagus on your plate! So it’s my new goal to prepare my asparagus beds in the Fall, just as I do the other beds. I will weed out the patch, cut back the bushes, clear out all debris, add a good layer of compost or manure and a thick mulch that will protect the roots, hold moisture, and prevent the overgrowth of weeds. 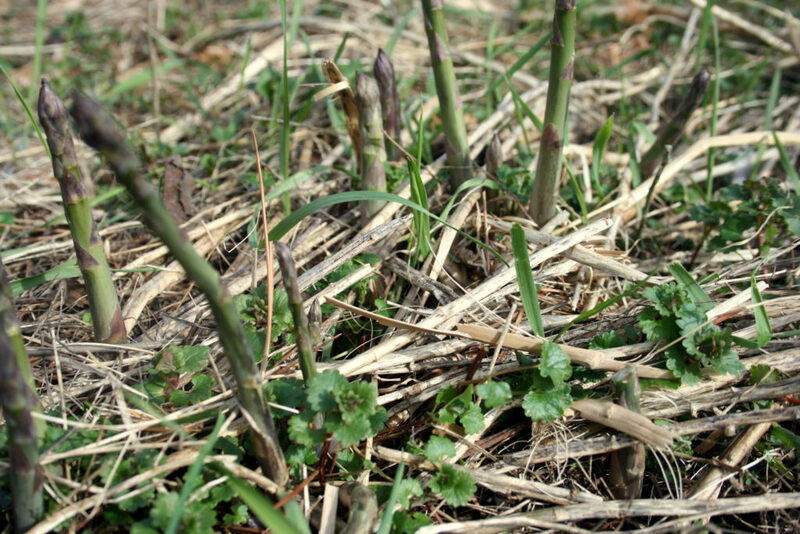 This little bit of Fall TLC will reward you with a strong patch of asparagus for years to come! So worth it! What chores get overlooked in your garden? 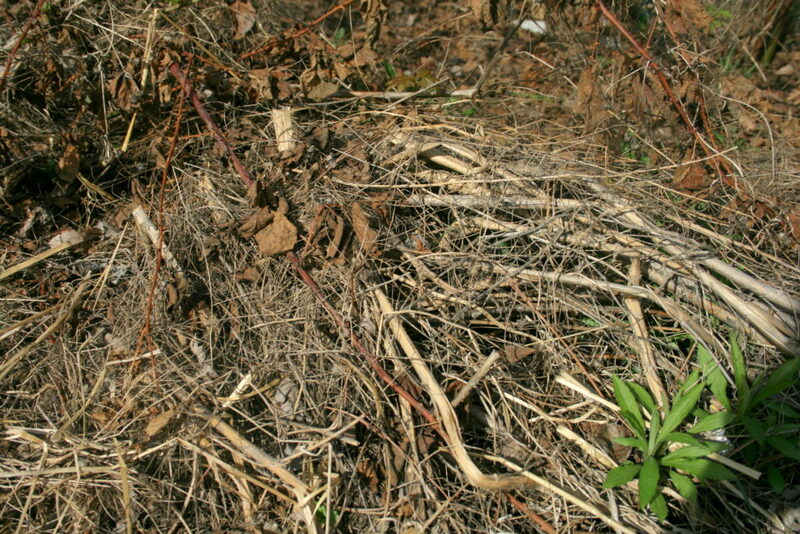 I just inherited this bed and the stalks are 4 or 5 feet tall, surrounded by weeds, and some stalks have fallen over and woven into weeds. What do I do to bring it back to health?